Batman Arkham games and The Riddler. I ignored them.... until Arkham Knight, where I hit the most annoying bug. If you do all the non-Riddler side missions before the final main mission, it won't let you trigger the end of the game until you finish off The Riddler. Wander around hoping interrogatable thugs show up. Ugh. Ouch, that must have been annoying, but i can understand that, i never 100% the Arkham games because i got bored of Riddler and his challenges or trophies, it just felt like a lot of busywork, particularly when you know the answer and it just revolves looking around for something to photograph or trying to do something. At most, i just saw the resolution to Riddler's story in Youtube, i really think they should have put a lot less collectibles in the game, or made the Riddler do, you know, actual riddles for you to solve!? I just can't help but feel like the Riddler would have been a lot more fun or engaging if you had to find him by solving 3 or 4 really hard riddles each game in a way that makes you feel like a detective rather than a guy trying to make reality work like Donkey Kong 64 and lots of trivia questions that can be solved by looking at a Batman wiki. Even Weird Al Yankovic got that when he played the Riddler in a cartoon, sure, he was obsessed with death traps and the riddles were really easy, but at least Weird Al was making him say riddles that aren't just Batman trivia questions! While not exactly a dealbreaker, the enemy respawning in Hexen is really annoying. Honestly, i found the level design the worst part about the game, and the puzzles, it's just not a fun game to explore, solve puzzles and activate switches in, it has a lot of cool ideas, don't get me wrong, but my God, i really don't like the level design of that game. I get what you mean. I'm playing through some Hexen WADs right now, and the puzzles really start feeling a bit samey and tedious after a while. It's certainly a very creative and ambitious game, boasting some impressive environments, weapons, and enemies, but I definitely prefer Heretic. I've heard Raven Software called "the kings of meandering level design." There's a reason Jedi Knight 1 was an absolutely epic blast, but Jedi Outcast singleplayer was such a snooze. Even more so than ruining the original trilogy, I resent the Star Wars prequels for ruining Lucasarts! They were one of the best computer game studios for years (with some missteps), but then the prequels came out and all they churned out was forgettable garbage. Wow, someone who finally agrees with me that Jedi Outcast was mediocre. It was also a very poorly written game. Personally I couldn't get more than two or three levels in, but I assumed the game picked up once you got your lightsaber. Isn't that what everyone loved about the game anyway? Dark Forces II, on the other hand, would have been a solid FPS even without lightsaber combat. What's the verdict here on Empire at War? I remember liking it back when it came out, but can't really get into it these days. That describes them pretty well, honestly, and you particularly feel that when playing Hexen which has a lot of level and it manages to make that feel even longer with puzzles and trying to find out what the hell a switch actually did. Honestly, i think there are other classic FPS games that are more fun to play like good old Doom, Duke Nukem 3d and Blood. I miss LucasArts, though less for their Star Wars games and more for their adventure games, maybe it's my nostalgia speaking, but as someone who played Monkey Island, Maniac Mansion, Day Of The Tentacle, Grim Fandango and other games growing up, i have a really big soft spot for their adventure games and it's what i miss the most about them...needless to say, when Thimbleweed Park came out, i bought that game as fast as i could. And can i just say i still think of LucasArts as being better than Telltale mostly because the plots and characters were funnier, the settings were actually original and creative, good music and you could actually walk around and solve puzzles(even if some had solutions that were a bit out there) instead of just doing some stuff and the game saying it will remember that? The genius of LucasArts was in how they approached design. They decided to stop punishing the player for exploring the environment. They also made sure you couldn't "miss" something crucial. They didn't waste the gamer's time. Unlike an action game, there is little joy in simply clicking on things in an adventure game. It's only fun once. Eliminating the "Game Over" screen and the tedious task of replaying the game elevated the puzzle solving and story to the front--and tore out the boring "unfun" replays that took away from the experience. Sierra had many successful and interesting games, but discovering you must "replay" an entire game of clicking and reading--after dying or finding out you missed something--after hours of play hurts those games. Absolutely agree, though part of it may be that i grew up with LucasArts while i only played the Sierra games till later, i have heard people justify it as making it harder or more like a tough adventure where you don't always know what you need to do, but it felt like the games could just randomly screw you over too much without telling you, it was way too easy to miss items in some games and the solutions could be a lot worse than the ones from LucasArts. I still love adventure games to this day, but i find myself being more interested in games that decide to not copy Sierra or take more inspiration from LucasArts and other companies that didn't screw you over all the time. Mostly because the genre has never been dead, small developers have always been making adventure games and then indie devs, though many of the new games still feel a bit worse than what LucasArts had to offer, though that may be my nostalgia speaking, but man, LucasArts knew how to make games with cool characters, settings and a lot of charm to them. 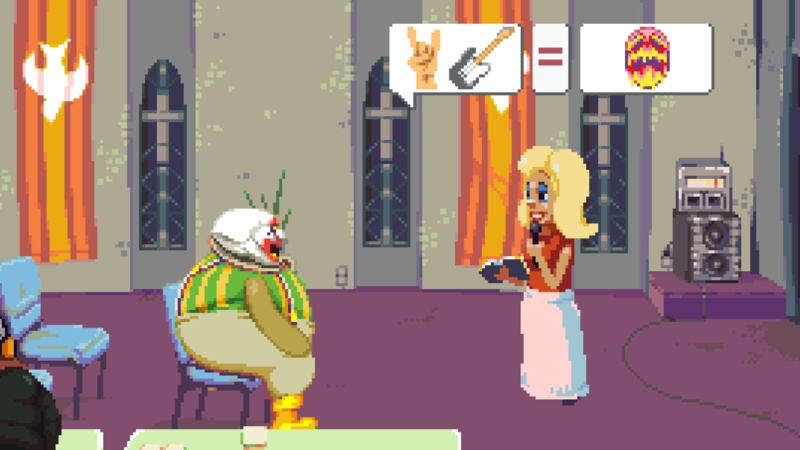 Dropsy, the game where you play as a mute fat clown and the story is told through word ballons with animations rather than words...and it's full of charm, a story that you can still understand, funny and Dropsy is something really rare, an actually nice clown in fiction! My God, this game brings a smile to my face at some points and it just reminds me of the good old days where LucasArts was around making adventure games. It also has a great soundtrack and the scariest vampire i have ever seen in a video game, so there is that too. There's a reason Jedi Knight 1 was an absolutely epic blast, but Jedi Outcast singleplayer was such a snooze..
Oh man thanks for the flashbacks. I remember spending ages trying to work out where I needed to go - right at the start of the game. It was a lift that was the same colour as the static scenery, so you could you only find out it was a llft by walking right up to it. In a huge room. In a corner. Off the beaten track. Then was a weird sequence along the lines of: hit button to summon a transport > duck jump out of a tiny opening to avoid it crushing you to death > run around half the stage to a point where you can get on it > hope you notice the small opening in a rock face off to one side > jump off and continue the level. Required such obscene timing and, well, if you were playing on console good luck executing a duck jump on a gamepad. Didn't realise you had to jump off? Yeah it sends you into a furnace. Jumped and missed? Try it all again lol. I think I must have saved before pressing any switches in the whole time I spent with it in case it kicked off something mad like that. Then you get to meet Luke Skywalker and I guess other stuff happens after that but I have no idea because I'd had enough. Jedi Knight was great. Mysteries of the Sith had its moments but went off the rails at the end. This was just a nightmare. That was the segment in Artus Mine. Am I the only one who didn't enjoy Dark Forces 2/Jedi Knight 1? The levels were extremely long and boring. I watched someone play it in one of those AGDQ events and even there the player took a very long time just to beat the first stage. I think it was the first FPS that allowed you to use a lightsaber and jedi powers, it was pretty cool but ultimately the level design killed my interest in the game. Dark Forces 1 on the other hand was very good. From what I've read it was very weak. The previous Star Wars strategy game, Rebellion (Supremacy in the UK), was much better, even if it had worse UI and graphics. In fact Rebellion does a lot of things that's still unique to this day. It's very character driven and every match plays out completely different from the other. - Set up decoys during missions to make them harder to be foiled by the enemy. Spies aren't just a nuisance, they're a real threat as even capital ships and the Death Star can be sabotaged by them, so counterintelligence is super important. Some characters can secretly be traitors as well, failing missions on purpose. And each of them has a small chance of being force sensitive for extra benefits. That's just the character system. Each side has different military units and plays differently from each other. Rebels generally have better starfighters while Empire has better capital ships, and so on. Again, the UI is bad and scare away many new players. But if you're willing to sit down and learn all its mechanics, you'll find quite a deep and enjoyable game. Incidentally I just finished playing Rebellion yesterday. I like the game very much and can talk about it all day.